Shokugeki no Soma, otherwise known as Food Wars! in the U.S. is a shonen manga that follows Soma Yukihira on his quest to become a better chef than his father. While the main premise seems a bit simple, the cooking techniques that are featured in this manga are anything but easy. Beginner cooks that want to learn how to cook via manga will have to look elsewhere. The manga does feature a few recipe pages for the intermediate cooks to tryout Soma’s style of cooking. Shokugeki no Soma is a cooking manga but cooking is often used as a motif for Soma’s transition to adulthood. 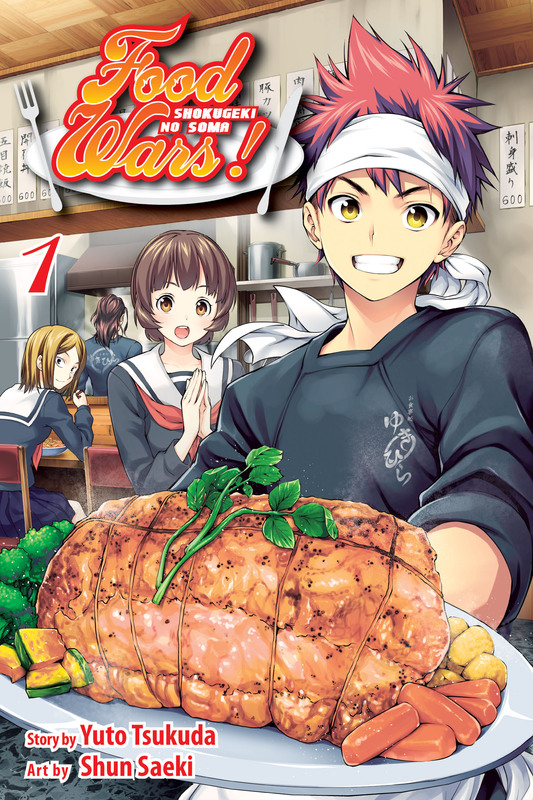 At its core, this manga is essentially a shonen battle manga with a kitchen themed battleground. While unique ideas can enhance a story, Shokugeki no Soma prefers to use a tried and tested formula in order to keep its readers entertain. By no mean does this make it boring to read, but one can’t help but think that they have read a similar manga elsewhere. The formulaic approach is a tried and tested method that several successful shonen manga have used before. It can be a boil down to two elements; a young and hot-blooded protagonists and his lofty goal of becoming the best ___ (fill in the blank). While Soma never explicitly states that he desires to become the best chef in the world, he does declare that he wants to become a better chef than his father Joichiro Yukihira. He is also known as old man Yukihara, who happens to be a chef capable of cooking at the Royal Manhattan hotel.While it is not based on a real hotel, Manhattan is often known as home to some of the best chefs in the world. Essentially Soma desires to beat his old man is synonymous with most shonen’s protagonist goal to become the best in the world. Perhaps the formula works because most readers can identify a time in their childhood when they wanted to be the best in their field of interest. The characters are vibrant but hardly original. Soma’s implied rival is an stuck-up loud mouth girl named Erina,l who came from a noble background. Old man Yukihara is the embodiment of a cool old-man with loads of experience in cooking. If the author decides to imply romantic interest between Soma and Erina, I will grill this manga and dip it in peanut butter. In the beginning of volume one, Yuto Tsukuda says that he read the autobiographies of famous chefs in order to write Shokugeki no Soma. He questions how much “drama is hiding behind [the] dishes that they serve so effortlessly”. It would have been good if he explained the drama that he found or interesting details about the lives of famous chefs. Perhaps that idea will be in future volumes, but as of now it seems that Shokugeki no Soma uses an idealize version of professional cooking. What interested me the most about the first volume was the one-shot that was included in the manga. While the characters and premise remains the same, it seemed that the main character was slightly altered when Shokugeki no Soma got serialized in Shonen Jump. Soma in the one-shot was less hot-blooded and a bit more mature in his demeanors. One of the few lines that changed Soma’s character in the one shot was when he told Erina that he found her cooking dull. He seemed rather displeased with Erina’s cooking whereas the new Soma would be eager to challenge Erina and tell her how his cooking is much better than her’s. Soma’s mature side is also shown when he lectures Erina on why he finds her cooking dull because she never fails. Ironically the quote relates a lot about how I feel about the manga itself, “the perfect recipe…leads [to] nowhere/ There are people out there…who think there’s only ever one right answer/ I can’t help but think those people…will never be able to discover something even better” It seems like the shonen jump editors had a lot of influence on the serialization of Shokugeki no Soma. Prime example being Soma’s original goal of tasting every last dish under the sun rather than beating his father at cooking. I can’t help but feel that the perfect shonen recipe will hinder Shokugeki no Soma from its discovery towards something even better.